An Inhuman guardsman with essentially human physical features. Kaal was a guardsman killed by marauding Alpha Primitives during Maximus’ most successful coups to gain the throne from his brother. Kaal was shocked to see an Alpha Primitive bearing an arm and his hesitation over the sight proved fatal as the Alpha shot and killed him. A latent Inhuman who was transformed was triggered by exposure to the Terrigen Cloud. Kaboom was empowered with the ability to generate fields of crackling electricity and fire bolts of this energy toward enemies. Kaboom adopted a supremacist attitude, decreeing regular humans as inferior and needing to be dominated and subjected by Inhumans such as herself. She was recruited by Lineage as part of an effort to draw out their fellow new Inhuman, Kamala Kahn (Ms. Marvel). Kaboom ventured to New Jersey where she caused a ruckus, hoping to draw the attention of the super hero. Her efforts succeeded and Kaboom and Ms. Marvel engaged in a huge battle. Ms. Marvel was victorious and Kaboom was defeated, whereupon she was taken into custody by the local authorities. Somehow, Lineage was able to engineer Kaboom’s release from the authorities and she once again engaged Ms. Marvel at New Attilan, after Ms. Marvel had been tricked into a trap by the duplicitous Kamran. Once more Kaboom proved no match for Ms. Marvel and the young Inhuman was again defeated. Her current status and whereabouts remain unknown. A young Inhuman whose transformation was caused via exposure to the Terrigen Cloud. Kacy has the ability to take in large amounts of air, causing her head and body to inflate like a balloon; she can then expel this air in a rapid gust of extreme force. Kacy was recruited by Lash and brought to Orollan. Lash had amassed a group of new Inhumans whom he ruled over. Lash convinced Kacy and the others that Medusa and Attilan represented an evil faction of the Inhuman populace who sought to exploit the others. Medusa led an attack on Orollan and Kacy fought against them alongside Lash. She fought well and used her abilities to create a massive gust of wind that extinguished Inferno’s flames. In the end, however, Medusa’s forces won the day and a tenuous peace treaty was forged between The Inhumans of Orollan and those of New Attilan. More recently, Kacy participated in a breach of this treaty when Lash ambushed Medusa in a trap orchestrated by Lineage. Kacy used her wind powers to imbue Lash with greater energy, allowing him to generate a force blast strong enough to break through Elligea’s force field, killing the advisor to the queen. Elligea’s sacrifice bought Medusa and the others the time they needed and they were able to escape the trap. Kacy current status and whereabouts remain unknown. Also known as The ‘Midnight Blade,’ Kal Blackbane is a Kymellian swordsman and member of the Universal Inhumans (one of a number of different alien species whom the Kree had subjected to the same Terrigenic experiments as Earth’s Inhumans). As part of a Celestial Prophecy, the regents of these diverse cosmic Inhumans came together and chose Black Bolt of Attilan as their king and leader. As a member of The Light Brigade (a group of warriors comprised of Universal Inhumans) Kal Blackbane and his comrades among The Light Brigade were sentenced to be sacrificed, an offering to the cosmic gods meant to anoint the creation of the Court of The Universal Inhumans. The Light Brigade stepped through the portal of Eldrac. Rather than sending them to oblivion, Eldrac chose to spare The Light Brigade and instead transported them to the Negative Zone. Whiled in the Negative Zone, Kal Blackbane and the Light Brigade were captured by Arthrosians. Annihilus, the then lord of The Negative Zone, forced Kal and his fellow comrades to fight in the gladiatorial arena against the Arthrosian champions. Kal and his colleagues were killed numerous times in the arena and each time, Annihilus used his Cosmic Control Rod to resurrect them so that they might fight, and die, again. When Human Torch of The fantastic Four was captured, he teamed up with the Light Brigade and together they engineered an escape. They managed a surprise attack on Annihilus and The Human Torch was able to wrestle free the Cosmic Control Rod, which he then used to create a portal to The Baxter Building on Earth. Kal Blackbane possesses super strength and durability as well as a near peerless skill with his scimitar-like sword. Following the disbanding of the Court of the Universal Inhumans, Kal Blackbane returned with his queen to the Kymellian home world. King Kaldan. An Inhuman who ruled over Attilan some two centuries ago. Not much has been revealed about King Kaldan except that one of his decrees was the imprisonment of two Inhuman criminals for unspecified crimes. These two were sent to a limbo-like side universe accessible only through a portal projector. Iso and Flint accidentally accessed this projector, allowing one of the criminals to escape. Fortunately, Iso and Flint were able to work together to subdue the escapee and he was re-incarcerated in one of New Attilan’s more traditional cells. An Inhuman who resembles a large yeti, with a massive frame covered in matted white fur, with sharpened claws and fangs. Kaliban possesses enhanced strength and durability. He is the twin brother of the Inhuman, Yeti, and possesses the same power-set and physical appearance. A member of the Royal Guard, Kaliban was assigned to patrol the subterranian passageways underneath Attilan back when the Inhuman city was located in the mountain range of the the Himalayas. There he encountered Johnny Storm of The Fantastic Four when the youth was trying to sneak into Attilan to see his off-and-on girlfriend, Crystal. Mistaking him for an invader, Kaliban and The Human Torch battled one another until The Torch’s flame powers got the best of Kaliban and the guardsman was forced to flee in search of reinforcements. Kaliban’s current whereabouts remain unknown. A member of the younger generation of the Inhumans of Attilan. Terrigenesis imbued Kalikya with healing powers and elongated her hands and fingers. These healing abilities did not manifest until a short while after Kalikya went through Terrigenesis and, at first, it appeared as though the Mists had simply elongated her hands and nothing else. Terrigenesis that led to physical mutations without the addition of special powers was not a terribly rare occurrence among the peoples of Attilan, and was viewed as an unfortunate result of poor genes or some sort of failing in the bloodline of the family lineage. Kalikya’s apparent lack of powers was seen as quite shameful. Many of Kalikya’s friends were endowed with impressive powers and abilities. Her best childhood friend, Tonaja, was gifted with wings and enhanced strength. Tonaja’s being transformed into a ‘flyer’ was seen as quite prestigious and it was assured that she would be assigned to the lofty position of a Royal Guardsman. Kalikya and Tonaja were now viewed as being of very different places of status. Kalikya asked if the two might still be friends, but Tonaja declined. It was all quite crushing for Kalikya. Later, during the siege of Attilan by human mercenaries, Kalikya discovered that her touch entailed impressive healing powers. She rushed into the battlefield and provided triage medical care to wounded Inhumans. Kalikya’s heroism was noted and her newfound abilities as a healer greatly enhanced her position of status on Attilan. Shortly thereafter, Tonaja attempted to rekindle their friendship. Kalikya was still quite hurt by how her former friend had previously scorned her and stated she wasn’t interested in refreshing their once close friendship. As time passed, Kalikya’s healing abilities further enhanced and she came to be among the foremost healers on Attilan. When Quicksilver, the husband of the Queen’s sister, Crystal, was injured in a fall, it was Kalikya who was called upon to treat him. Quicksilver had endured near fatal injuries and had multiple spinal fractures, yet Kalikya was able to mend these wounds and Quicksilver ultimately made a full recovery. Kalikya’s current whereabout following the fall of Attilan and the establishment of New Attilan remains unknown. A latent Inhuman whose transformation was triggered by the Terrigen Cloud. Karan was imbued with the ability to store and discharge large amounts of bio-electricity. He can transfer this energy to objects, causing them to explode, with an explosion the size and destructibility relative to the variable size of the object he charges. Kamran can additionally emit short bursts of this energy in electrical touches that act like taser shocks that are able to briefly incapacitate a foe. Kamran’s body glows in a bluish bioluminescence when his powers are active and he can transform back and forth from this form at will. Kamran’s parents immigrated from Pakistan shortly before his birth. Kamran was born in Jersey City where he and his family were close friends of the Khans. Kamran and Kamala Khan were roughly the same age and childhood playmates until Kamran’s family relocated to Houston when Kamran was five-years-old. Kamran proved to be a gifted student and he finished high school early, earning acceptance to the Massachusetts Institute of Technology. The night that he and his family moved back to New Jersey, the Terrigen Cloud floated over Jersey City and activated Kamran’s latent Inhuman powers. Unlike many new Inhumans, Kamran was endowed with the ability to turn his powers on and off and maintain a human appearance when not utilizing his powers; thus enabling him to keep his newfound Inhumanity a secret from his family and friends. Kamran and his parents came to visit the Khans and Kamala was initially put-off by having to spend time with her over-achieving former playmate. She was surprised to find that not only had Kamran grown into a very handsome young man, he also shared many of the same interests and hobbies as Kamala… she was quickly smitten. During an attack by the new Inahuman known as ‘Kaboom,’ Kamran witnessed Kamala transform into Ms. Marvel. Afterwards, Kamran confronted Kamala over the matter and divulged that he too had been transformed into an Inhuman… a matter that acted to further intensify Kamala’s crush on him. Sadly, Kamran proved to not be as honorable and perfect as Kamala had perceived him to be. Although he was bright and good looking, Kamran had had a hard life. He was a Muslim growing up in Texas in the shadow of the attacks of 9/11 and it is quite likely that he endured a great deal of bigotry, abuse, and alienation from his peers. Discovering that he was an Inhuman with tremendous powers proved to be a revolution for him… he no longer had to be as powerless and isolated as he once felt. This made him an easy recruit for the scheming Inhuman, Lineage. Lineage felt that The Inhumans should be the new masters of the world… an ideology that Kamran easily fell in with. Lineage was quite intrigued by Kamala Khan, feeling as though there was something special about her bloodline and Inhuman powers. He used his pawns, Kamran and Kaboom, to lure Kamala into a trap and Kamran tricked Kamala into Lineage’s clutches. Broken-hearted over Kamran’s treachery, Kamala was nonetheless able to break free from her confinement and escape Lineage. Lineage was ultimately defeated by Medusa, Iso, and the other Inhumans. Kamran seems to have taken over what Lineage had started, however, and he executed a plot to abducted Kamala’s older brother, Aamir. Kamran had hoped that Aamir also possessed the Inhuman gene and that he might be transformed into a powerful new ally. Ms. Marvel with the aid of Captain Marvel foiled Kamran’s scheme and rescued Kamala’s brother. Kamran’s current status and whereabout remains yet to be revealed. A member of the Inhuman Royal Family. Karnak is the son of Mander and Azur, dignitaries of very high status in old Attilan. Mander’s sister, Rynda, had been the queen and was the mother to the crown prince, Black Bolt. It was believed that both Mander and his wife, Azur, possessed excellent bloodlines and that Terrigenesis would endow both their sons with tremendous Inhuman gifts. Yet when their elder son, Triton, emerged from the mists he had been transformed into an aquatic being with green scales who required a water-based atmosphere to survive. Although Triton would eventually go onto be seen as a great warrior highly esteemed among The Inhumans, his initial transformation was viewed as shameful and monstrous. Azur was so distraught over her elder son’s transformation that she chose not to subject her younger son, Karnak, to The Terrigen Mists. Instead, young Karnak was sent to live in the Tower of Wisdom where he learned the ways of a secretive sect of gnostic Inhuman monks. There Karnak was taught philosophy, spirituality, along with an esoteric and highly effective brand of martial arts. Karnak had been an especially gifted and precocious child to begin with and he greatly excelled under the monks’ tutelage. Through his studies and meditation Karnak cultivated the ability to identify the weakness of all things. This awareness enables him to perceive the precise points of vulnerability in any given object. Identifying such points of weakness, coupled with his skills as a martial artist, aided him in becoming a highly formidable warrior. He could strike an object and, knowing the precise point to hit, shatter it into countless pieces. As Karnak further honed these abilities, his perception for weakness has expanded beyond the physical. He is now able to perceive points of weakness in a more abstract fashion, such as spotting the weakness in a tactical plan, philosophical theories, or even the base sense of another person’s sense of character. 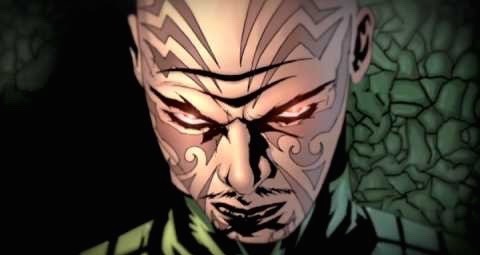 Following his return from the Tower of Wisdom, Karnak’s reminded judgement and enhanced awareness earned him the position as the advisor to his cousin, King Black Bolt. Although Karnak has not always seen eye to eye with his king, he has frequently remained Black Bolt’s most staunch advocate, chastising any who would question royal decree. Karnak’s strict pragmatism and unyielding adherence to the customs and laws of Attilan notwithstanding, he has maintained a very close friendship with his cousin, Gorgon, whose impulsivity and hedonism cast him as very much Karnak’s opposite. Their differences aside, Karnak and Gorgon greatly enjoyed each others’ company and the two have embarked on many adventures together. As a member of the Royal procession, Karnak has fought valiantly in numerous battles in defense of Attilan. He has matched wits against foes that include Magneto, The Mandarin, Blastarr, Ultron-13, Ronan The Accuser, and of course Maximus The Mad. Karnak assisted in rescuing Queen Medusa from The Wizard, helped save Ahura Boltagon from the clutches of Blackheart, and was a participant in the fabled Kree-Skrull War. Along with his role as an advisor to the king, Karnak was also heavily involved in the training of the younger generation of Inhumans. The queen’s niece, Luna Maximoff, was among Karnak’s most prized pupils. Karnak experienced something of a psychological crisis in the wake of The Fall of Attilan and the release of The Terrigen Cloud. It still remains unclear what exactly had led Karnak to feel so despondent and undone (my best guess is that he became aware of the encroaching alternate realities and the end of existence as entailed int he lead up the to the Secret Wars mini-series). In any case, Karnak seemed to come to the conclusion that his knowledge and awareness of this secretive matter made him a risk that needed to be eliminated. He took his own life, leaping from the top floor of Avengers’ Tower and falling to his death. Although Karnak’s body died, his soul or essence lived on. It turned out that Karnak is a distant relative to the new Inhuman known as Lineage. Lineage’s specific Inhuman powers allows him to keep the souls of all his past descendants within him, ushering forth any given decedent to advice him and provide secretive information. Karnak’s sentience found itself trapped within the limbo-like confines of Lineage’s mind. Initially mistaking this limbo as hell, Karnak came to see the confinement as a type of prison… and like any prison it was not without a flaw, a means of escape. Karnak ultimately divined this flaw and exploited it, causing him to burst out of Lineage’s midsection in a fully reconstituted version of his former physical being. The whole turn of events was quite confusing, but the long and short of it is that Karnak was reincarnated and reunited with his former allies among the Inhuman Royal Family. Having died and subsequently reincarnated has had a profound effect on Karnak, leading him to delve into his spiritual studies with an invigorated interest. The original Tower of Wisdom had been destroyed when old Attilan fell. Karnak has since constructed a new Tower in the desolate plains of an undisclosed countryside. He has amassed a group of followers, acolytes made up of humans and Inhumans alike. The basic tenets of Karnak and his followers’ faith is a bit difficult to describe. Based in an ancient philosophy of old Attilan, it appears to be something of a combination of Taoism and neo-nihilism . He believes that life is fleeting and ultimately meaningless and the full and entire acceptance of this raw truth brings about an awareness and contentment that frees one from the obscuring illusions of meaning. 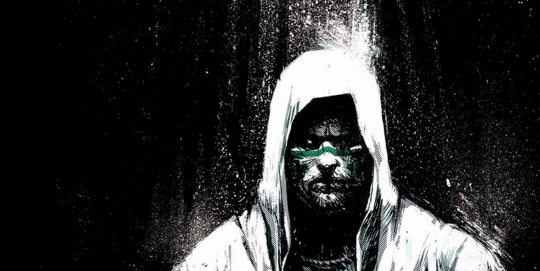 Shedding himself from the distracting shadows of faith, belief, and the construct of existential meaning, Karnak is able to see things as they truly are: empty and ultimately insignificant. And it is this true, unadulterated vantage is what allows him to perceive the fault in all things. Karnak’s reinvigorated dedication to this rather stark and disquieting philosophy has left him a good deal alienated form others. He has yet to rekindle his old friendship with Gorgon; the humans that he interact with are terribly frightened and disquieted by him, and he has rarely participated in mission alongside his fellow Inhumans of New Attilan. As mentioned earlier, Karnak has not gone through Terrigenesis. He seems to prefer to keep it this way, which means that he has had to keep an eye out for the Terrigen Cloud (in that exposure to the cloud would trigger his transformation). He has avoided the cloud by monitoring its location as well as sequestering himself in hermetically sealed chambers within the new Tower of Wisdom. What might occur were Karnak to ever go through the transformation of Terrigenesis remains unknown. Most recently, Karnak has been recruited by the governmental agency Shield to help rescue a young Inhuman named Adam who had been abducted by a splinter faction of the criminal organization, AIM. Karnak went in search of this youth only to discover that Adam’s new Inhuman powers offers him a degree of reality manipulation. Adam’s gifts led him to essentially take over the AIM splinter group, reforming the group into a cult that worshipped him. When Karnak finally confronted Adam, he discovered that the young man had become everything that Karnak hates: a false god, fabricating an artificial sense of meaning by offering his followers the comfort of manufactured faith. Adam escaped this initial confrontation, leaving Karnak annoyed and committed to ending the threat that this young man poses to the world. How this tale may ultimately resolve is currently unfolding in the pages of Karnak’s ongoing solo series, by writer, Warren Ellis, and artists, Geraldo Zapfino and Roland Boschi et al. An Inhuman from the Marvel Cinematic Universe. Katya and her mother, Eva, had lived in the Inhuman sanctuary of Afterlife. Katya’s mother had become overwhelmed with the worry that her daughter would not be selected for Terrigenesis. Eve ultimately stole a small cache of Terrigen Crystals and fled to the human world. There she exposed herself and Katya to Terrigenesis. Katya was endowed with the power to control minds. Unfortunately, she was too young to properly control these powers and she became like a parasite, needing to feed on the feelings of others (especially the sensation of pain). Katya and her mother were eventually tracked down by Agents form SHIELD. Katya had taken over the minds of a group of local criminals as well as a SHILED assault team. She was going to murder these victims along with Agent Melinda May. So to save herself and the others, May was forced to shoot and kill young Katya. It was an extremely traumatic experience for Agent May, leading to her temporary retirement from field duty. Katya was portrayed by actress, Ava Acres. Alice Kedzierski: A NuHuman whose Inhuman abilities were triggered by the Terrigen cloud. Ms. Kedzierski is a housewife who possesses the power to transfer mass between objects. Unfamiliar with the nature of her new abilities, Alice’s powers accidentally shrank herself (along with her neighbors) into the Microverse. They were eventually saved by the intervention of the Uncanny Avengers. Ms. Kedzierski current status and whereabouts remain unrevealed. An Inhuman with brown skin and slightly reptilian features. The nature of Kellon’s powers remain unrevealed, but he had acted as a member of the Royal Guard as well as the Elite Guard during the war against the Shi’Ar Empire. Following Attilan’s relocation to the Kree world of Ron-Kar, Kellon became a member of Gorgon’s security staff, protecting Kree refugees. His current status and whereabouts remain unknown. The governmental agency of Shield had been tracking Hydra’s efforts and they sent their agents Clint Barton (Haweke) and Kate Bishop (also Hawkeye) to raid the Hydra facility and rescue these kids and put an end to project communion. The two Hawkeyes succeeded in their mission and the three children were handed over to Shield custody. Shortly thereafter, Clint and Kate became concerned that Shield might end up using these children in the same fashion as Hydra had planed. The two Hawkeyes eventually decided to themselves abduct the kids from a Shield facility and held up with them in Clint’s apartment. Unfortunately, Hydra had been tracking the Hawkeyes and laid siege to the apartment building intent on reclaiming the kids. During the fracas, the kids unleashed their psionic powers creating a psychic wave that killed a number of the Hydra soldiers. Yet it was not enough and the arrival of reinforcements enabled Hydra to retake the kids. Once more the kids were rescued by a Shield team led by Clint and Kate and assisted by Clint’s brother, Barney, who has infiltrated Hydra’s ranks. Rather than turning the kids over to Shield, The Hawkeyes decided to relocate the kids to Barney’s private island where they could live in safety and peace. Presumedly, these kids are still residing on this island. A latent Inhuman whose transformation was the result of exposure to the Terrigen Cloud. Ren had previously been a classical dancer. Terrigenesis had caused her hands and forearms to become covered in a sharp, metallic, armor-like skin. From these hands she can generate long, razor-like ribbons that she possesses mental control over. Shortly after her transformation, Ren was pursued by the evil Caroline le Fey who wished to recruit Ren into her villainous group, The Doom Maidens. Ren was rescued by Valkyrie and The Fearless Defenders. Although Ren was reluctant to see herself in the role of superhero, she ultimately chose to join The Defenders in fending off Thanos’s invading forces during The Infinity Event. Ren and the Fearless Defenders traveled to New Amazonia where they fought off Thanos’ generals, Aradena and Echidna. While on New Amazonia, Ren had a brief romance with her Defender teammate, Annabelle Riggs. The Fearless Defenders have since disbanded and Ren’s current status and whereabouts remain unknown. Hopefully, she will show up soon in one of the ongoing Inhuman titles. Along with being a very cool character, Ren also holds the honor of being the first Inhuman to outwardly identify as a member of the LGBT+ community. An Inhuman with amphibian features and clawed hands. Karen was a member of the Royal Guard and patrolled the grounds of Attilan during the nightshift with his partner Tolos. He was killed by one of Thanos’ Outriders who had come to Attilan to glean secret strategical information from Black Bolt. Karen was ultimately avenged when Black Bolt destroyed the Outrider whom had taken Kiren’s life. An elder Inhuman who formerly held the position of Chancellor of the Genetic Council. One of the more senior members of the council, Kitang maintained a very conservative view on Inhuman society and held steadfast to sustaining the old ways of eugenics and arranged marriages (despite the growing disapproval of such matters by the majority of society of old Attilan). King Black Bolt’s decision to free the enslaved Alpha Primitives was disapproved of by many of the elder members of the ruling government. Black Bolt had additionally engineered the relocation of Attilan from the Himalayas to the Blue Area of the moon. Attilan’s move to the moon offered the citizens of Attilan an unprecedented time of peace and security. As a result, the people of Attilan no longer felt as reliant on the protection that Black Bolt offered. All of these factors this resulted in an ebb of the power of the monarchy as well as an increase of the power of the Genetic Council; leaving Chancellor Kitang one of the more powerful and influential figures in Attilan. It was around this time Queen Medusa announced that she was pregnant. Kitang objected to the pregnancy in that Medusa and Black Bolt’s union was not in adherence with his policy and interpretation of eugenics. Due to the potentially destructive nature of Black Bolt’s powers, it was decreed that it would be too dangerous for him to sire a child. Kitang ordered Medusa to terminate her pregnancy. Medusa vehemently refused this awful decree and absconded to earth to give birth to her son, Ahura. She later returned with her newborn son, proving that Ahura was indeed no threat to the safety and wellbeing of Attilan. Kitang remained undeterred and he ruled that Ahura be placed in the care of The Pacifyers to further guarantee that the child did not develop destructive powers on par with his father’s. Angry and still convinced that young Ahura might prove a threat to the safety of Attilan, Kitang enacted a secret plot to have Ahura relocated to earth and placed in the care of a kindly couple in real America. This plot was eventually discovered and Karnak and Gorgon were sent to earth to recover Ahura and bring him back to Attilan. Kitten’s scheming proved his undoing and his was forced to relinquish his seat on the Genetic Council in disgrace. Hie predecessor, Arcadius stepped in to become the new Chancellor. This was the last that was seen of Kitang and his current status and whereabout remain unrevealed. Kiting possessed slightly goblin-like features, but whatever Inhuman powers he may have possessed was left unrevealed. Medusa’s maternal grandfather. Kobar married La and together they had two daughters, Ambur and Azur. Amber went on to marry Quelin and their children were Medusa and Crystal. Azur, meanwhile, married Mander and their children were Triton and Karnak. An Inhuman who lived on Attilan way back in the third century BC. Kovad was the Court Minister to King Perrus. He is a distant relative of the new Inhuman, Lineage, and an aspect of his sentience lives on in Lineage’s consciousness. Aleksandra Nikolaevna Kravinoff was born into a wealthy family in Russia. She married Sergei Kravinoff, the super villain and frequent foe of The Amazing Spider-Man known as Kraven The Hunter. Together they had a child, a daughter named Anastasia. Soon after Anastasia’s birth, Kraven took his own life after failing in his latest effort to defeat his arch nemesis, Spider-Man. Sasha Kravinoff had been privy to her late husbands dealings as a super villain, as well as the many secrets of dark magic he had accrued throughout his adventures. Sasha studied these magics as part of an effort to resurrect her dead husband. Through a deadly series of events, Sasha was able to succeed in her goal. The spell required the sacrifice of Spider-Man. Sasha had believed she had captured Spider-Man, but had actually ensnared his clone, Kaine. Still believing she had the real Spider-Man, Sasha murdered Kaine and used his blood as part of the magical ritual to bring Kraven back from the dead. The fact that she used a clone’s blood had something of a negative effect on the reincarnated Kraven… he no longer possessed his former lust for the hunt. The real Spider-Man eventually foiled Sasha’s schemes and the Kravinoff family was forced to flee to the Savage Land. Sasha berated her husband for no longer being the man he once was. Kraven lashed out and killed his wife, breaking her neck. Kraven then turned to his son from a previous marriage, Alysosha, and his daughter with Sasha, Anastasia, and stated that he would train whichever of the two were successful in hunting and killing the other. Anastasia or ‘Ana’ ultimately succeeded, killing her brother and winning her father’s approval and tutelage. Years later, following the triggering of the Terrigen Bomb, Anastasia discovered that she possessed Inhuman DNA and would go through Terrigenesis were she exposed to the Terrigen Cloud. How she came upon this knowledge remains unrevealed, but Anastasia stated that the Inhuman lineage was on her maternal side, indicated that her mother, Sasha, had also been a latent Inhuman. Ana Kravinoff. A latent Inhuman who is aware that she possesses the Inhuman gene, but has thus far managed to evade Terriegen Cloud and the Inhuman transformation that it may cause in her. Ana is the young daughter of the Spider-Man foe known as Kraven The Hunter. Ana’s mother, Sasha Kravinoff, was obsessed with providing her beloved husband a child whom he would be proud of, who possessed his same fighting and hunter skills. To this end, Sasha Kravinoff began her daughter’s training from an extremely early age. Young Ana was taught multiple forms of martial arts, and every conceivable form of hunting, tracking, and identifying prey. Ana had a natural ability for these things and the constant training from such an early age honed her into a formidable hunter; yet it consequentially interfered with her psychological development, leaving her something of an unfeeling sociopath. Kraven The Hunter died before Sasha could present him with what she had honed Ana into. The adolescent Ana took it upon herself to take up the mantle of Kraven The Hunter and stalk and kill Spider-Man. At the time, Spider-Man’s alter ego, Peter Parker, was sharing an apartment with a roommate named Vin Gonzales. Ana had tracked Spider-Man to this apartment, but she mistook Gonzales as Spider-Man and abducted him. Forcing Gonzalez to wear the Spider-man gear, Ana set up a hunt where she stalked Gonzalez through the New York sewer system, intent on killing him. The real Spider-Man eventually figured out what had happened and he intervened in time to save Gonzalez from Ana; although Ana managed to escape being apprehended. Ana next showed up during the ‘Grim Hunt’ storyline in the pages of Amazing Spider-Man. In this tale, Ana’s mother had engineered a complicated plot to resurrect her husband by way of blood magic. Ana and her half-brother, Alyosha, and their uncle, the villain known as The Chameleon, acted together to attack and abduct many of the spider-themed heroes that Spider-Man had teamed up with in the past. All of this was in service of capturing Spider-Man himself, whom Ana’s mother had planned to murder as part of a spell to resurrect Kraven. They succeeded in this, but rather than killing the real Spider-man, Ana’s mother sacrificed Spidey’s clone, Kaine. The real Spider-Man eventually foiled Sasha’s schemes and the Kravinoff family was forced to flee to the Savage Land. The resurrected Kraven lashed out and killed his wife, breaking her neck. Kraven then turned to his son, Alysosha, and his daughter, Ana, and stated that he would train whichever of the two were successful in hunting and killing the other. Ana ultimately succeeded, killing her brother and winning her father’s approval and tutelage. Years later, following the triggering of the Terrigen Bomb, Anastasia discovered that she possessed Inhuman DNA and would go through Terrigenesis were she exposed to the Terrigen Cloud. How she came upon this knowledge remains unrevealed, but she made an arrangement with Crystal and her All New Inhumans team to help them learn the whereabouts of a secret Inhuman society in Mozambique in exchange for providing sanctuary from the Terrigen Cloud. Having located Utolan, Ana attempted to force the scientists and geneticists there to somehow ‘undo’ her Inhuman genes. She felt that it made her less than human, an inferior specimen unworthy of the Karvinoff name. Yet there was no means of taking away Ana’s inhumanity and she ultimately chose to accept her fate. She allowed the Terrigen Cloud to overtake her and began the process of Terrigenesis. How and it what fashion the Terrigen has transformed Ana remains to be seen. A young man who lived in Norway during the time that the Terrigen Cloud passed over the upper eastern section of the Atlantic ocean. A bored, irascible and somewhat chauvinistic young man, Kristen felt that he was destined for great things in his life, that he sensed a change on the horizon. His feelings provide prophetic, but perhaps not in the specific fashion in which he imagined. Kristen possessed the Inhuman gene and exposure to the Terragin Cloud caused him to be transform and become encased in a Terrigenetic Cocoon. This cocoon was quickly absconded by the renegade Inhuman, Lash, who was looking for new Inhuman recruits for his cause. Lash viewed the surge in NuHumans to be heretical and an abomination. In his mind, only the worthy, the best of the best, should be allowed the privilege of Terrigenesis; and those whom he deemed unworthy needed to be eradicated. When a transformed Kristen emerged from the cocoon, he appeared weak and enfeebled. His good looks were replaced by a pale, goblin-like form. It is unknown what specific Inhuman gifts the youth had been endowed with. Lash was disgusted by the NuHuman’s initial sense of being weak and unworthy. Placing his hand on a confused Kristen’s forehead, Lash released an energy blast and vaporized him into dust. A large and powerful Inhuman who possesses enhanced strength and durability as well as the ability to grow two-fold in size. Krush used gauntlets with extended side-blades as his primary weapon. A member of the Royal Guard, Krush was assigned to patrol the abandoned settlements on the Blue Area of The Moon near Attilan. He was on such a patrol when he encountered a group of Kree who were seeking refuge on Attilan. These Kree were actually assassins and Krush aided the royal family in putting down the threat these assassins posed. An ancient Inhuman who belonged to a group known as The Mayapan. This was a fellowship of Inhumans who posed as Mayan deities some 1000 years ago. These individuals began as citizens of the ancient Mayan Empire who had wondered off to a secluded section of the countryside. They came across a spring that was connected to a subterranean cache of Terrigen Crystals. They drank from the spring, exposing themselves to the Terrigen. The Terrigen-infused waters proved fatally poisonous for most of these individuals, but for a small handful of them it triggered Terrigenesis. One of these Inhumans was transformed into a large, anthropomorphic snake-like form with featured wings. He renamed himself ‘Kukulkan’ after the Mayan sake deity, K’uk’ulkan. Kukulkan and his fellow Mayapan ultimately returned home and used their newfound powers to take over the Mayan Empire, demanding that they be worshiped as gods and that a series of pyramids be constructed for them. The Mayan people eventually rebelled against these Inhuman overlords and somehow managed to defeat and destroy the Mayapan. Ixchel, the last surviving member of these Inhumans, fled into an astral realm along with the disembodied life essences of her fellow Mayapan. She remained there in stasis for over a thousand years until she was awoken by a fissure cracked into the astral realm, accidentally created by the super-beings, She-Hulk and A-Bomb. Released, Ixchel manifested a giant ziggurat in the middle of the Canadian Rockies. She drained the life-force from She-Hulk, Lyra, and A-Bomb, using the energies to reincarnate Kukulkan and the rest of their fellow Mayapan. The Red Hulk and Alpha Flight investigated the creation of this Mayan Pyramid and engaged the Mayapan in a tremendous battle. The Red Hulk was ultimately victorious and was able to restore She-Hulk and the others, forcing the Mayapan to again flee to the astral realm. This was the last that the Mayapan have been seen from and it is presumed that they continue to be imprisoned on an astral plane. A young Inhuman who was bestowed with the ability to cast powerfully realistic illusions. Kurani was trained by Karnak to utilize her abilities in combat situations. She was promoted to the Royal Guard and later accompanied Gorgon on a mission to New York which was intended to intimidate the US Government into returning a stolen cache of Terrigen Crystals. This mission went south when Kurani’s fellow guardsman, Jolen, killed several unarmed humans. Gorgon’s squad was engaged by The Fantastic Four as they attempted to flee. Kurani and the others were defeated and ended up taken into custody by the Office of National Emergency. They were all eventually freed by Dewoz, who used his teleportation abilities to spring Kurani and others from their imprisonment. Kurani current whereabouts following the fall of Attilan during The Infinity Event remains unknown. A winged Inhuman who lived on Attilan centuries ago. Kylus, like many of the winged Inhumans, saw himself as being of greater status and superior to the non-winged Inhumans. Kylus rallied his fellow winged Inhumans together and demanded of King Nestor that the private enclave of Aerie be built, exclusively for the winged Inhumans. Kylus was given his ways, but the creation of Aerie, held aloft by anti-gravity projectors, only acted to further strain tensions between the winged and non-winged Inhumans. Kylus decreed that Aerie should secede from Attilan. Most of the winged Inhumans had bird-like, feathered wings whereas a small minority had bat-like, leathery wings. Kylus’ fearful bigotry deepened and he declared that all bat-winged Inhumans were not ‘pure’ and should be purged from Aerie. In short time all of the bat-winged Inhumans were slaughtered. It was the final straw and King Nestor granted Aerie its secession, severing the tether that connected the floating city from Attilan and leaving the winged Inhumans to their fate. Aerie struggled greatly on its own, many of its citizens starved. Eventually, Aerie was able to attain self-sufficiency and ultimately thrive. No longer having access to the Terrigen Mists located on Attilan, the scientists of aerie devised a means to pass down their winged gifts to subsequent generations. Kylus died and new rulers Aerie were elected. As time passed, the citizens of Aerie came to feel a great shame over their bloody origins and the slaughter of their bat-winged kin. The floating city of Aerie has appeared more recently in the pages of a three-part series taking place in one-shots of Spider-Man, Captain America, and Inhuman. The Terrigen Cloud, which had trigger Terrigenesis in numerous unsuspecting Inhuman decedents across the globe, had a much more dramatic effect of the citizens of Aerie. Exposure to the cloud caused the populace to endure a secondary Terrigenese, mutating then into savage avian beasts. Red Raven had remained the sole human on Aerie, the advanced sciences of the floating city affording him enhanced strength and a grossly retarded aging process. Enraged over what had been done to his people, Red Raven set off on an attack on New Attilan, now situated on the banks of The Hudson. It took the combined strengths of Spidey, Captain America, the Royal Family and the new Inhuman recruits to repel Raven’s attack and save both cities. In the end, Medusa swore to Red Ravin that all would be done in her power to revert the the secondary notations that had besieged Raven’s people. To what extent this task will succeed, however, remains to be seen.